Our ‘butterfly in flight’ is a luxurious addition to our contemporary butterfly collection, made by and exclusive to Love from Skye on the Isle of Skye. This design features two intricately cut-out butterflies – a polished finish butterfly with raised wings resting on top of a flat, frosted finish butterfly. Made from Sterling silver, this necklet measures 50mm x 25mm with a depth of 10mm. 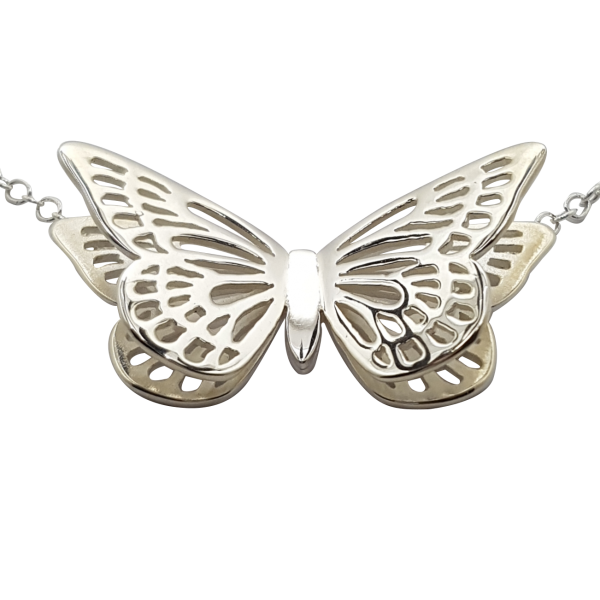 This flying butterfly piece is presented on a heavy gauge trace chain which is attached to the reverse of the necklet, creating a total length of 18 inches.